Tae Kwon Do is the Korean Art of self-defence and means ‘The Way of Hand and Foot Fighting’. It is a version of an ancient form of unarmed combat practised for many centuries in the Orient. Tae Kwon Do came to be perfected in it’s present form in Korea. Translated from Korean, “Tae” literally means to jump, kick or smash with the foot. “Kwon” denotes a fist chiefly to punch or destroy with the hand or fist. “Do” means art, way or method. 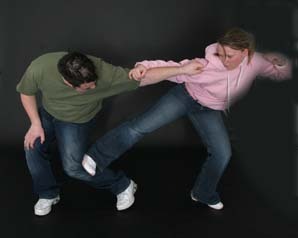 Tae Kwon Do indicates the technique of unarmed combat for self-defence, involving the skilled application of punches, kicks, blocks, dodges and interception with the hand, arms and feet to the rapid destruction of the opponent. Tae Kwon Do was inaugurated in South Korea on April 11, 1955 following extensive research and development by the founder Major General Choi Hong Hi, 9th Degree Black Belt. It was introduced into the United Kingdom in 1967. To the Korean people Tae Kwon Do is more than a mere physical use of skilled movements. It also implies a way of thinking and life, particularly in instilling concept and spirit of strict self-imposed discipline and an ideal of noble moral rearmament. In these days, where violence and intimidation seem to plague our modern societies, Tae Kwon Do enables the weak to possess a fine weapon to defend him or herself and defeat the opponent as well. When wrongly applied it can be a lethal weapon. Even if Tae Kwon Do is practiced for exercise alone, the enjoyment derived will justify the time invested and spent. As an exercise it is equally suitable for old as for the young, for men and for women.